Do you remember the last time you failed in something? I bet it involved your lack of preparation. Our lacking to prepare for things that matter, most often will result in failure. The same holds true when selling a home. You must prepare for selling your home to avoid common home selling mistakes. What if you never sold a home before or if you have and your last experience was less than desirable? Here’s where you must rely on your Realtor’s direction to guide you on preparing your home for sale. There is so much that can be done to prepare your home. As I’ve said before, preparing your home for sale is like setting the stage for a broadway show opening, with the audience being prospective home Buyers. The behind the scenes activity involves thorough cleaning, making needed repairs, removing clutter and staging your home. Staging does not necessarily mean you must hire a professional stager, as a talented Realtor can also direct you. Now you’re ready for the show to open; to list your home for sale. Having a young child at home, busy with work and their personal lives, Asher and Penelope didn’t keep a really tidy home. After speaking with their Realtor, they knew what needed to be done to get their home ready to sell. It involved some elbow grease and they understood that it mattered if their intentions were to sell their home quickly and for top dollar. They put forth the effort and were happy to have been provided with some direction on what needed to be done in their home. Not having sold a home before they were more than grateful for their Realtor’s suggestion and it paid off in a big way! One of the foremost reasons that Seller’s homes do not sell is due to an inaccurately priced home. This comes from either the Realtor not pricing the home right and/or not being able to advise the homeowner properly on setting the right price or simply pricing the home as the homeowner desires, knowing very well that future price reductions will be needed. That was their little secret however, as they would do anything just to get the home listing; a.k.a “buying a listing”. When a home is priced right when first listed for sale, Sellers can anticipate well qualified Buyers will see their home, ready and able to make the purchase. When a home is not priced right, Buyers ready, willing and able to see their home will not see their home as those Buyers will be looking at other Seller’s homes who are priced correctly in their price point. The Buyers that will be looking at the overpriced home, will not be interested, when they realize they can get a larger home with more features than your home that is priced too high. By the time you come around to realizing your home is not selling, you reduce the price in an attempt to find a Buyer, chasing a Buyer at this point, only to find out that the languishing of your home on the market isn’t getting Buyers excited about your home had it been priced right from the very beginning when a new home listing gets all the excitement and buzz around it. Asher and Penelope understood this principle well when setting the selling price for their home, even though initially they were thinking they had wanted to set their initial list price higher, until their Realtor thoroughly explained the above to them. Their Realtor didn’t simply agree with any price they wanted to start with, but explained to them the reasoning behind setting an accurate home selling price which closely examined how their home compared to recent home sales in the area. Once they set their emotions aside, they cleared their thinking and it all made sense to them and they were glad to have listened to their Realtor. In fact, they ended up receiving two interested Buyers competing for their well priced home and sold their home for the full asking price. Talk about being thrilled! We live in the age of the Internet now. When you get an ache you go to the Internet to see if you can play Doctor for the day to search for the reason you’re aching. Or if you’re considering buying a new computer you seek out recommendations over the Internet. So what do you think 92% of Home Buyers do when they’re ready to buy a home? They begin their home search looking for homes for sale over the Internet. This is a big deal to you, as a Home Seller because you want these Buyers to see your home that is listed for sale. Buyers want to see Photos, lots of high quality photos and videos. When Asher and Penelope saw their home’s photos and video, they almost wanted to buy their home all over again! They had started by googling their Realtor’s name and saw her apparent knowledge of the Real Estate industry. She had pages splashed across the internet that shouted her knowledge. Incredible, they thought, if she has the ability to market herself in such a manner, imagine what she could do in finding a Buyer for their home. They wanted their home to be shouted to the world to see; the world of prospective Buyers, that is! Their home was blasted everywhere as their chosen Realtor knew the value of the vast internet and it’s reach along with value of social media and it’s impact in reach. When we set out to do things in life we set timeframes as we just don’t like to wander aimlessly in our attempts to meet those desired timeframes. We must have a plan in how we go about meeting those timeframes. This can’t be any more important than when the time comes to sell a home. Haphazardly trying to reach the goal of selling a home, will result in a less than favorable outcome. Certain criteria must be set that include the home selling practices of a home’s preparation, the home’s list price, the marketing of the home, effective communication and negotiation skills of the Realtor, along with determining the Buyer’s ability to secure financing; all ensuring a timely home sale. When Asher and Penelope’s home sold they were thrilled to be moving on so quickly as Penelope was pregnant with their second child and were anxious to move into a larger home and the thought of having a second child in the home they were trying to sell was a bit stressing for them. Their Realtor had kept their stress to a minimum selling their home in a relatively short period of time. Let’s move! What have other home Sellers experienced? You want to be a part of the group of home Sellers that have reported on great home selling experiences. You want to be nestled amongst the 50 plus percent of home Sellers that report they were very satisfied with what they experienced¹. Nobody wants to be part of the home selling horror stories we hear. Online reviews are everywhere and should be easy for you to discover about any Realtor that you’re considering hiring. You’ll find customer reviews on Realtor’s websites and the major Real Estate portal sites in order to get a very good idea of what you can anticipate if you hire that Realtor. Asher and Penelope had no trouble in finding great reviews on their chosen Realtor. In fact, they recall many reviews where customers had reported on just how absolutely professional this Realtor had been and knew her market like the back of her hand to get homes sold. That’s what they wanted. They wanted to meet this person. The rest is history. Of course, along with a great reputation comes the ability to be able to trust someone. In any relationship both personal and business, you must have trust. Trust is what relationships are built upon. If you can’t trust someone to sell your home, how can you ever anticipate good results. Sometimes trust has to be earned, however when it’s time to hire a Realtor you don’t have the time to get to know a Realtor fully, to court them, so to speak. Trust begins by doing your research to discover what you can find out about them. Read what they’ve written that appears on their website, other websites and social media networks, look at their blog posts and articles on the Real Estate industry. Experience matters. If you can’t find a website or any of their demonstrated Real Estate know how, how would you know that they are capable in helping you sell your home? Would you want to simply rely upon that they tell you that they can be trusted? Or do you want to see some proof? Of course, we have to trust our instincts. Our instincts are very powerful in providing us with clues about people. Make it easy on yourself and have a back up to your instincts, a second method in which to verify. Check out their online presence. Look at their website, their Google+, Twitter, Facebook, Pinterest and Linkedin profiles to start. Find out all that you can. The internet makes your job so much easier nowadays, particularly when you get a recommendation from a friend or family member. You then get online and type in their recommended name; it’s like an open book. Read it and decide if this is the type of person you really can trust to sell your home. Also, once you speak with the Realtor, they should be able to answer your questions with ease and provide clarity to you about selling your home. They need to be able to demonstrate their Real Estate knowledge. And if you aren’t asking questions, they should anticipate what is important for you to know and discuss it before you even have to ask. Asher and Penelope discovered a lot about the Realtor they chose as they looked into all that she was about as she was spotlighted across the internet. They liked what they discovered online and in person. They liked how knowledgeable she was about the Real Estate market and the home selling process. This Realtor knew her job and knew how to treat her customers. Exactly what they were looking for in a Realtor. In Real Estate everything is local, particularly when you’ve likely heard the importance of location, location, location. The location includes all about the local Real Market, it’s economy, its government, its residents and schools. How these all fit together or don’t can drive the local Real Estate market. What is the Real Estate market experiencing? Is it a Seller’s Market, a Balanced Market or a Buyer’s market. These different markets will dictate how a home is sold. They illustrate supply and demand. A Seller’s Market, as the name implies will favor Sellers. There are limited number of homes for sale where Buyer demand will outpace the available homes (inventory). Multiple offers can be common place in a Seller’s Market when several Buyers may be trying to buy the same home which can drive up home selling prices. In a Balanced Market, there’s a good balance between the number of homes for sale and the number of Buyers wanting to buy homes. This market has a stabilizing effect where demand isn’t heavy on one side or another. A Buyer’s Market favors Buyers. The inventory of homes for sale is high and Buyers have a large selection of homes from which to choose from, which differs from what they experience with the limited supply of homes in a Seller’s Market. This market has Sellers trying to stand out from the competition to appeal to the limited number of Buyers for their homes for sale and homes will take longer to sell. With the obvious differences inherent in local Real Estate markets, it’s critical that Realtors know how to advise the home Seller according to the particular, current market. Absorption rates will spell out the type of market. It’s important to know too that Absorption rates can vary by neighborhoods within a city, where one neighborhood may be experiencing a greater demand than another. Absorption rates will let you know how long it can take you to sell your home. Again, another indication of how to effectively sell a home and how it should be placed for sale within the market. The Realtor for Asher and Penelope had explained the Real Estate market for their city and neighborhood putting them in the upper end of a Seller’s Market as apparently they were getting ready to cross over into a Balanced Market. They were amazed at what their Realtor knew about their local market. It was clear to them that she stays on top of the local Real Estate market and valued its importance in getting their home sold. Asher and Penelope thought that these two were important to be lumped together; kinda how peanut butter & jelly go well together. They felt that a good sense of humor comes with the job that you’re passionate about. Sure the word passion gets thrown around a lot, yet it’s easy to be heard and seen when a Realtor really loves what they do. It’s their joy, their excitement, their fervor that elicits the feeling that you just know they love what they do. It’s almost as if they’re wearing it, a scent that surrounds them. And it’s true, when you’re passionate about what you do day in and day out, it’s easy to be able to laugh at things and yourself. When the high stress of the job kicks in, the natural medicine of humor can often work wonders to lighten a mountain in the making. Don’t just take my word for it, ask Asher and Penelope! As you can see, it’s easy to love your REALTOR®! Use this as a guideline so you know what to look for when you hire a Realtor. Don’t settle. 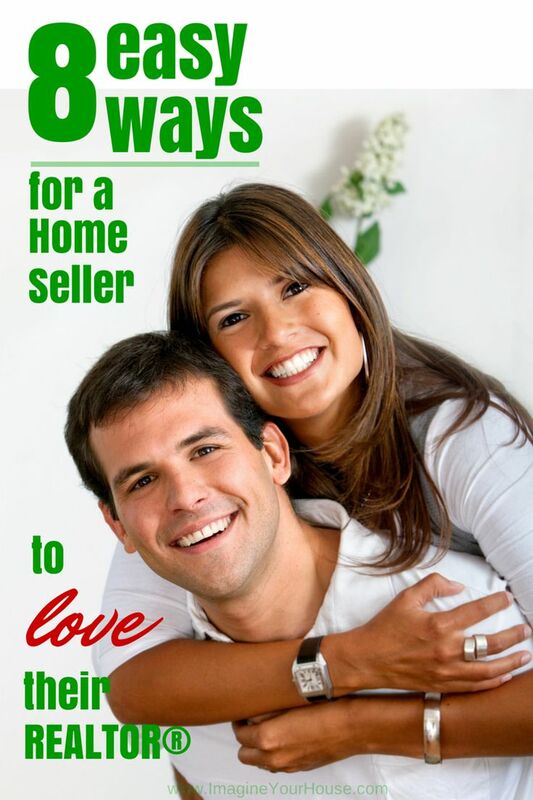 Ensure that these 8 easy ways are covered and you’ll be well on your way to selling your home and loving your Realtor!